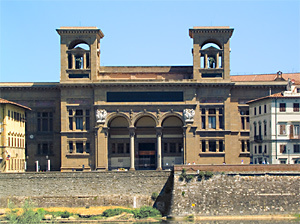 The Library had origin from the librario bottom of Antonio Magliabechi, constituted gives approximately 30.000 volumes and left, in 1714, to the city of Florence. In the 1737 granducale administration it established that the published works to Florence were deposited and, in 1743, extended the garnishment to that published in all Tuscany. The Library was opened to the public in 1747. In the 1774 Antonio was assigned to them to part of the library of the doctor Coconuts. Consisting increments reached as a result of the abolitions of the ecclesiastical agencies. In the 1861 it came to them accorpata the Library Tippet, constituted from the Granduca Ferdinand III of Lorena. In 1885 it assumed the name of National Library and, in 1875, the name of Centers them. From 1870 it has the press right on the national territory.